Mish's Global Economic Trend Analysis: Moving Ahead with "Pension Progress"
Moving Ahead with "Pension Progress"
Buried in a transportation bill that President Obama signed on July 6, 2012, was a change to make it appear pension plans are better funded than they really are. The bill was called Map-21 "Moving Ahead for Progress in the 21st Century Act". Here is a catchy logo and stated goals. Remove the highest risk drivers, vehicles, and carriers from our roads and prevent them from operating. MAP-21 took effect October 1, 2012. Budget is $561 million in fiscal year (FY) 2013 and $572 million in FY 2014 for the Agency's administrative expenses and grant programs. Buried in the Text of Map-21 is SEC. 40312. PENSION FUNDING STABILIZATION. "(I) IN GENERAL- If a segment rate described in clause (i), (ii), or (iii) with respect to any applicable month (determined without regard to this clause) is less than the applicable minimum percentage, or more than the applicable maximum percentage, of the average of the segment rates described in such clause for years in the 25-year period ending with September 30 of the calendar year preceding the calendar year in which the plan year begins, then the segment rate described in such clause with respect to the applicable month shall be equal to the applicable minimum percentage or the applicable maximum percentage of such average, whichever is closest. The Secretary shall determine such average on an annual basis and may prescribe equivalent rates for years in any such 25-year period for which the rates described in any such clause are not available." No one reading that would likely figure out the implication (at least without a great deal of effort). However I can give you a real life example. I wasn't aware that the federal laws had been altered to make the pensions seem more solvent. 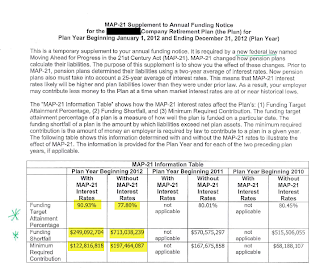 Apparently there is a new federal law, MAP-21 (Moving Ahead for Progress in the 21st century Act), that changes how pension plans are allowed to project future earnings/liabilities based on the interest rate calculation period. Attached is a recent notice we received as plan participants, and how our pension plan magically improved due to the law. This company went from being 77.80% funded to 90.93% funded. This company had a shortfall of $713 million but it's now $249 million. The company's minimum contribution dropped from $197 million to $123 million. How did this magic happen? 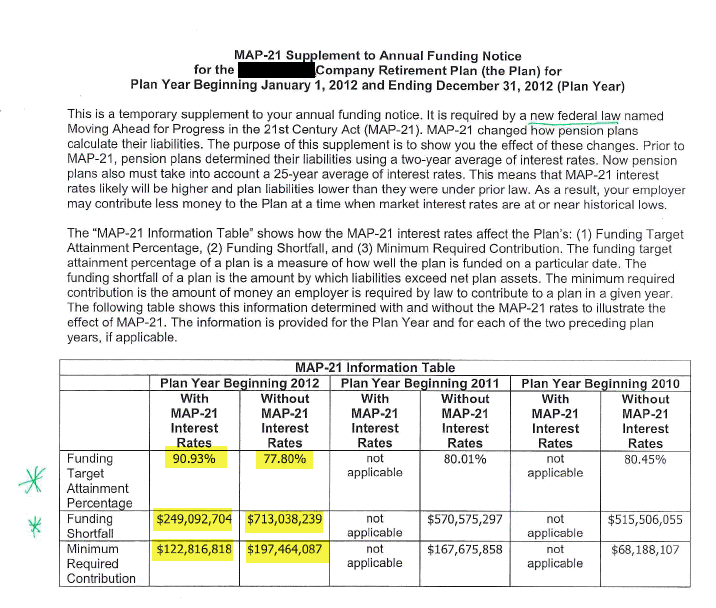 Easy: Prior to Map-21 pension plans had to determine liabilities based on a 2-year average of interest rates. After Map-21 companies could use a 25-year average of interest rates. As a result, companies get to contribute less when interest rates are low. I would like to point out this is precisely when companies ought to be contributing more! It is extremely difficult to meet plan assumptions when corporate bond yields are in the gutter. Here's two more questions: What was the "real" purpose of this bill? Did it have anything to do with transportation?